Editor’s note: Senior Independent Study (I.S.) is a year-long program at The College of Wooster in which each student completes a research project and thesis with a faculty mentor. We particularly enjoy I.S. in the Geology Department because there are so many cool things to do for both the faculty advisor and the student. We post abstracts of each study as they become available. The following was written by Richa Ekka, a senior geology major from Jamshedpur, India. She finished her thesis and graduated in December, so her work is the first of her class to be posted. You can see earlier blog posts from Richa’s study by clicking the Estonia tag to the right. In July 2012, I travelled to Estonia with my advisor, Dr. Mark Wilson, a fellow Wooster geology major Jonah Novek, Dr. Bill Ausich and three geology students of The Ohio State University. It was quite an adventure with a few unexpected changes in our travel plans. Dr. Wilson and I had to spend a day in Tallinn, waiting for Jonah as his flight was delayed. 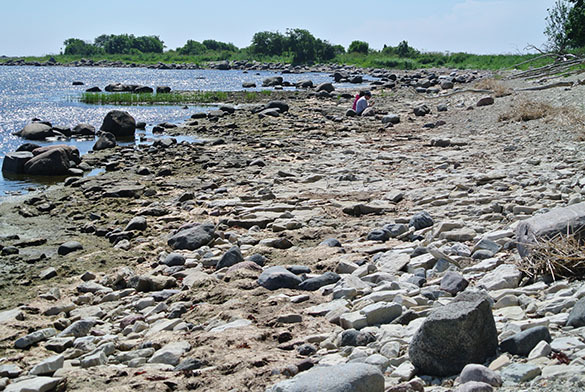 Upon Jonah’s arrival we headed for the island of Saaremaa, where I carried out my research. We stayed in Kuressaare, on the southern shore of the island. I did my field research on the Soeginina Beds at Kübassaare in eastern Saaremaa. The Kübessaare coastal area is an outcrop of the Soeginina Beds in the Paadla Formation (lowermost Ludlow) that represents a sequence of dolostones, marls, and stromatolites (see figure above). The Soeginina Beds represent rocks just above the Wenlock/Ludlow boundary, which is distinguished by a major disconformity that can be correlated to a regional regression on the paleocontinent of Baltica. The occurrence of these sedimentary structures and fauna in the Soeginina Beds provide us with evidence that there was a change in paleoenvironmental conditions from a shelfal marine environment to a restricted shallow marine setting followed by a hypersaline supratidal setting. The base of the section has Chondrites trace fossils and marly shale that represent a shelfal marine environment. The next section on top has dolostones with Herrmannina ostracods, oncoids, and eurypterid fragments that indicate a shallow marine setting (lagoonal). 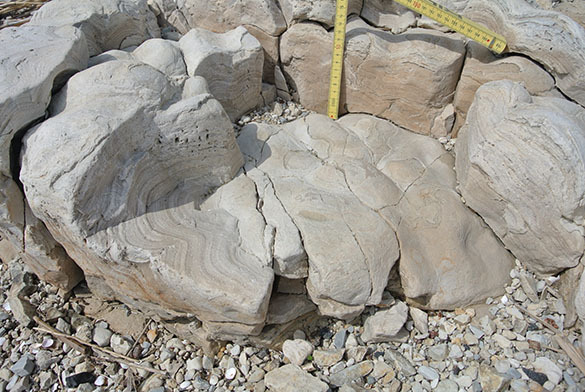 The next section above has stromatolites (see figure below) that form in exposed intertidal mud flats. The topmost section has halite crystal molds that represent a hypersaline supratidal setting. Thus, we see a change from shelfal marine environment to a restricted shallow marine setting and finally to a hypersaline supratidal setting.